With a bold new year, I felt it would be appropriate to start off this article of the year with a bold statement: The Mac is Dead! Yep, you heard right, The Mac is dead. I'm sure that raised an eyebrow or two - or maybe a couple hundred. I can hear everyone already saying, "You moron! The Mac is here, stronger than ever! What are you smokin'?" Before the jury of Mac fanatics imposes a guilty sentence on me for uttering such inflammatory words, I'd like to explain why said this. The Mac is dead in the traditional sense of the word. The Mac of today is a watered down shell in many ways compared to what the true Macintosh is. Let me be clear - I have great respect for Apple. I like Apple. I appreciate everything they've done for the computer industry. Their innovations, their ease-of-use, and the quality that goes into their software is unmatched. No one in the computer industry has done what Apple has done. First there was the machine that started it all, the Apple I. Then came arguably the most successful Apple computer line to date, the Apple II. Next up were two lines that ultimately flopped, the Apple III and the Lisa. Along comes 1984, a year we would be introduced to what would ultimately be deemed the flagship Apple product line for the next 20+ years, the Macintosh. 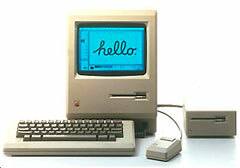 The Macintosh started life as a neat little box, more of an appliance than a typical computer. With it's 9" black and white 512 x 342 resolution screen, 128 KB of memory along with a 400 KB floppy drive - but most of all, the first affordable GUI system ever released - it cemented the Mac's place in computing history. The Lisa, although equally as revolutionary, was hardly affordable, selling for a startling US$10,000. Through the first few models, the Mac grew and evolved. The modem and printer ports would be a permanent fixture until 1998, when the iMac replaced them with USB. When the Mac Plus was introduced in 1986, it introduced another mainstay of the Mac, and the external SCSI port also remained until 1998. With the Mac SE and Mac II in 1987, ADB would replace the RJ-11 keyboard and external mouse port. ADB lingered on until 1999. Networking capabilities consisting of LocalTalk/AppleTalk would also be a mainstay for many years, eventually displaced by ethernet. Along the way, the ability to power up the Mac with the keyboard was added. Other hardware technologies that made the Mac stand apart, such as NuBus expansion slots, also added to the Mac's identity. In the mid-90s, the Mac started undergoing a hardware transformation. While practical (and some would argue much needed), it would eventually start to strip the Mac of it's identity. A PC standard technology was adopted, and PCI expansion slots replaced NuBus. IDE hard drives and CD-ROM drives were introduced, slowly replacing SCSI. In 1998, the Mac underwent even more PC-fication when the iMac was introduced. The floppy drive, gone. ADB, gone. Modem and printer ports, gone. SCSI ports, gone. What replaced them? In the case of the floppy drive, nothing. (I feel Apple did the smart thing in doing away with the floppy drive.) USB and later FireWire would replace ADB, modem, printer and SCSI ports. USB was an innovation of guess who? A group of seven companies - Compaq, Digital Equipment Corporation, IBM, Intel, Microsoft, NEC, and Northern Telecom - that made Windows PCs. FireWire was initiated by Apple, and its co-developers included Texas Instruments, Sony, Digital Equipment Corporation, IBM, and SGS Thomson. Although invented by Apple, these days FireWire seems to be getting the shaft in favor of USB. ADB would hang on in some Mac models until late 1999, when the Blue & White G3 was discontinued. As if all of that weren't enough, the ability to start the Mac with a power key on the keyboard was taken away by 2000. The last thing hardware-wise that remained unique was the Mac's PowerPC processor. In 2006, gone. In terms of hardware, the Mac has essentially become a PC. I think some of these changes were necessary, so I'm not going to lament all of them. I can even deal with some of the ones I felt weren't necessary. Even if you look past the hardware, and instead look at the software side, where the Mac's true identity lies, you'll find Apple stripped the Mac of its identity even further. We can safely say that OS X was a necessary change. The problem with this is Apple felt they had to reinvent the wheel. The user interface in OS X isn't as consistent as the Classic Mac OS was. Sure, Aqua's cool, and OS X is built on Unix (a solid foundation!). OS X is easier to use in a lot of ways, but they forgot Classic Mac OS users out when Apple went Intel. They forgot what had originally made the Mac the Mac. The Application Menu on the right side, gone. The Apple menu is still around, but it's not nearly as useful as it once was. The Dock is a mixed bag. While it's useful, it can be a pain in the rump roast for switching between applications. And let's not forget something that truly made the Mac great and it's often one of the most overlooked parts of the Mac experience, the Happy Mac. Since Jaguar, the Happy Mac that once greeted Mac users, inviting them into the Mac experience, was replaced with an Apple logo. A dull, gray, Apple logo. Oh the horror! Susan Kare's simple, wonderful, and most of all beloved addition to Andy Hertzfeld's Mac ROM, the Happy Mac, doesn't exist in modern Macs. I can hear the complaints already: "You're being silly. You're nitpicking. What makes the Mac is the OS and design of the Mac." No nitpicking here, just tellin' it like it is. Just so you'll know, I know many of these things that have been removed from the Mac can be brought back through haxies. Even the Happy Mac can be added back on the PowerPC models - with a promise of software on the Intel side to bring it there as well. But come on, why should we have to put back what Apple shouldn't have taken out in the first place? The Mac is no longer the Mac in my eyes. It's more like Coca-Cola is today. The cans say Coca-Cola Classic, but Classic it ain't. It doesn't have the fizz it once had. We still have the bong sound on the Mac (affectionately known as the chord), but how much longer will it last? I can hear more comments: "The Mac has evolved; it can't stay the same forever." But the Mac hasn't evolved overall. Yes, it's evolved OS-wise, but when it comes to the charm and the magic of the Mac, it hasn't progressed. It has instead regressed and evaporated. On the hardware end, the Mac has conformed to the PC "standard". Wasn't it Steve Jobs who said, "It's better to be a pirate than to join the Navy"? Well my friends, Apple has joined the Navy. Apple's old slogan used to speak volumes when it came to the Mac and people who used it, "Think Different". Apple is no longer thinking different. Sure, OS X is cool and easy to use, and the designs of the hardware are pleasing to the eye, but that's all the difference you'll see now. Keep in mind, I'm not blasting Apple entirely. I love OS X for the most part. Apple is still great at making "insanely great" software and designing hardware that's sure to draw oohs and ahhs. However, I don't believe they should be calling these things Macs when it's painfully obvious that the things that used to make up the Mac are gone. The real Macintosh is dead. Which leads me to this thought: I think it's time for Apple to retire the Macintosh and start a new product line. If you think about it, it's been long since time for another major computer product line. The Mac line has been around for 23 years. The machine Apple calls now the Mac is nowhere near what the Mac once was in many ways, so they need to call it something entirely different. Just think about it - a new machine for a new generation of Apple faithful. Apple's gotten big with name changes. While the Intel switch was underway, they did away with the iBook, PowerBook, and Power Mac names. I think it's time for a bold change. A new Apple computer line for a new generation of Apple faithful. Please Apple, let Jef Raskin's (considered the "Father of the Macintosh" by many) baby go out with dignity. I'm "Thinking Different." To put this in perspective - to mimic the words of Steve Jobs when he announced dropping the "Computer" part from Apple's name - I say this. From this day forward, I've made a decision. I'm dropping any reference to Macintosh or the Mac when referring to today's Apple computers to reflect the direction the company is taking. May the true Macintosh rest in peace.